Deadpool is a fictional character who breaks the trope of having cheekbones sharp enough that you can get papercuts from the front of the pages he appears on by looking like a melted candle with scabies. The comics establish that the reason Deadpool looks the way he does is because his body is riddled with cancer that his mutant healing factor is constantly fighting. However, the Merc with a Mouth takes this in his stride, describing himself in one comic as looking like Ryan Reynolds (who’d just been voted the sexiest man alive at the time) crossed with a Shar Pei. According to Ryan Reynolds someone recommended the Deadpool comics to him on the set of Blade: Trinity, and the panel of Deadpool describing himself like this was literally the first thing he saw after turning to a random page. The actor described it as “F***ing destiny” and made a promise to himself that he’d portray Wade Wilson on screen if it was the last thing he did. As interesting as that all is, we think it’s more strange that Deadpool, a character known for breaking the fourth wall, somehow hand-picked the actor to play him and it worked. For years before the release of the live-action X-Men movies, Patrick Stewart was consistently put forward by fans as the perfect man to play Professor Charles Xavier. This sentiment was echoed by the people making the first X-Men movie, who likewise considered Stewart to be their number one pick to play the wisest and baldest X-Man. Released in 1998, the comic Planet X is a crossover story in which the cast of Star Trek: The Next Generation meet the X-Men. Largely unheard of today, the comic is notable for a brief scene in which Captain Picard (who was played by Patrick Stewart in the TV show) meets Professor X on the ship’s holodeck. The two men study each other for a moment, and Picard’s internal monologue reveals that he thinks they look alike. Harrison Ford is an actor known for playing two characters: Han Solo and Indiana Jones. Though it’s believable, given the time-travel and interdimensional shenanigans that often go on in X-Men comics, that Professor X could meet Captain Picard, the idea of Han Solo meeting Indiana Jones is kind of ridiculous. Ladies and gentlemen, let us introduce you to the comic Into the Great Unknown. In this comic, Han Solo crash lands on Earth sometime in the past and is killed by natives. Chewbacca survives and, owing to the longevity of his species, continues to live in the woods where they crashed for over a century, becoming a legendary monster similar to Bigfoot or the yeti. This legend just so happens to be investigated in the modern day by one Indiana Jones, who stumbles across Solo’s corpse slumped in the cockpit of the Millennium Falcon. Rather than doing his job and plundering the ancient spaceship filled with world-changing technology that could probably cure cancer or something, he simply notes that he feels connected to the corpse somehow and leaves it, and Chewbacca, in peace. Aren’t comics fun? We won’t be breaking any new ground by saying that the film Independence Day: Resurgence kind of sucked. We may break ground, however, by revealing that Jeff Goldblum exists and is famous within the Independence Day universe and that he’s canonically met and spoken to the character he plays, Dr. David Levinson. In an official 20th Century Fox YouTube video that has, at the time of writing this, about 96,000 views, it’s established that Jeff Goldblum exists in that universe. The video goes on to note that since the events of the 1996 film, a conspiracy theory arose that he and Levinson are the same person. The video debunks this by having both men meet. Oddly, Levinson – despite him and Goldblum having the same face – only feels they have a “fleeting” resemblance and even appears to not know how to pronounce Goldblum’s name. The Ultimate Marvel series of comics is a reimagining of the Marvel universe, exploring the comic giant’s sizeable roster of heroes and villains from a different perspective. To this end, characters have different backstories, motivations, and in the case of Ultimate Nick Fury, a lot more melanin. Specifically, Ultimate Nick Fury is Samuel L. Jackson. To be clear, we don’t mean that the character looks like Sam Jackson. The artist who reimagined the head of SHIELD explicitly based his appearance on Jackson without his permission. This understandably annoyed Jackson, who called Marvel after seeing a comic with his own face on it staring back at him in a comic store. Rather than suing for unauthorized use of his likeness, Jackson instead used them jacking his look as leverage to secure himself a 9-picture deal. The live-action Spider-Man series has been rebooted more times than a PC running on Windows 10 and right now, there are three actors known for playing him. Of these actors, though, only one – Tobey Maguire – enjoys the unique honor of being name-dropped by Peter Parker himself. In the comic Spider-Girl #82, Spider-Man’s clone, Ben Reilly (a near-perfect clone of Spider-Man who is identical to him in almost every single way) has a baby. Upon seeing this baby, Mary Jane notes that she thinks the baby looks like Peter, which makes sense because the baby is the son of a clone who has his face. Peter, on the other hand, dismisses this, instead insisting that the baby more closely resembles Tobey Maguire. This suggests the two share at least a passing resemblance. It’s worth noting that Tobey Maguire makes another appearance as himself in the Ultimate Universe, in which he’s shown playing Spider-Man in a movie based on his exploits. However, Spidey never comments that the two look alike in that universe. Being a trickster god, Loki is, of course, no stranger to using his magic and nigh-infinite power to mess with lowly mortals. 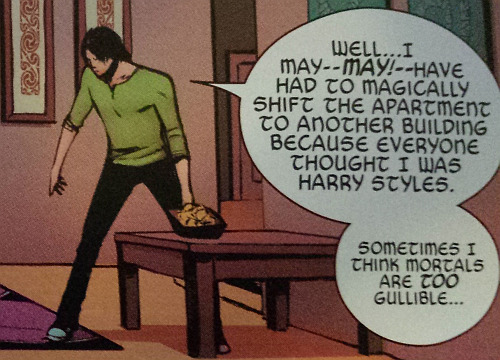 In the series Loki: Agent of Asgard, though, the god decides to use his powers in a decidedly more human way: tricking girls into thinking he’s Harry Styles from One Direction. This apparently goes over a little too well, though, and Loki’s uncanny resemblance to the singer causes so many girls to throw themselves at him in one comic that he has to use his powers to warp his entire apartment across the city. This causes endless amusement for his teammates, who routinely spend entire pages making fun of the fact he looks like he should be in a boy band. Pinky and the Brain is a cartoon with more layers than an onion-filled lasagna. It’s a cartoon simultaneously intended for kids that also once, for no real reason, featured a joke so obscure only adults with an unhealthy obsession with Orson Welles would get. The joke was basically the entire punchline of the short Yes Always, which spoofs a now infamous argument the legendary director had with a producer while recording a spot for frozen peas. The short not only rips some lines from Welles’ outburst wholesale, but features the Brain’s voice actor, Maurice LaMarche, channeling his best impression of the director. Dubbed “a $250,000 inside joke” by the crew because they figured nobody would get it but them, the short was written to emphasize that LaMarche was basically parodying Welles every time he delivered a line as the Brain. Lucifer Morningstar is a DC character who possesses a plethora of god-like abilities, ranging from omnipotence to the ability to fire lasers from his eyes. Created by writer Neil Gaiman, the character is similar to his religious counterpart in that he is a fallen angel who defied God eons ago. However, the comics note that this Lucifer eventually got bored with running Hell and retired to open a bar in Australia, a plotline we think the Bible should totally steal. Gaiman reportedly had only one instruction for the artist that helped bring Lucifer to life: he must look like David Bowie at all times. Every time the artist sent a piece of concept art that didn’t look like Bowie, Gaiman would return it with a picture of Bowie and a note saying he’d continue to do so until he got David freaking Bowie. Eventually, he did. What’s more, Gaiman has since explained that the only reason his interpretation of Lucifer looks like David Bowie is because he felt the singer was the only person cool enough to pull off being the Prince of Hell. Although Lucifer himself never comments on the fact he looks like the late singer in any comic, the TV show Lucifer, which is an adaptation, does show that the fallen angel is a massive fan of his music. Which is amazing, because it means it’s the official position of DC that the devil is a fan of David Bowie.